Q: How did you choose the topics that are raised in I Wonder? Are the questions in the book based on conversations with your daughter or other children you’ve worked with? Harris: I was inspired by my many conversations with children over the years, especially my daughter. The search for the moon came directly from her, actually. She became very interested in the moon when she was 18 months old, and she was always pointing it out in the sky. If you look closely, you’ll see that the moon is in every illustration in the book. But the choice of topics was strategic. In addition to helping children say “I don’t know” to more simple questions, I wanted to delve into the questions that inspire awe. To me, they arise from four types of mysteries: 1) fundamental forces that are mysterious, like gravity; 2) the mystery of something that can be known in principle but not in practice, such as the exact number of grains of sand; 3) the inherently mysterious quality of a concept like infinity, which is impossible for us to grasp intuitively no matter how much we may “understand” it mathematically; and 4) the mysteriousness of impermanence: life and death, the fact that everything is changing from one moment to the next, and the larger question of how something comes from nothing, or why there is something at all. At the level of our emotional experience, fear and excitement are close cousins; I wanted to point to an alternative to the fearful reaction to these concepts that is so often modeled in our culture. They can be wonderful mysteries to enjoy! Q: In the story, the mother asks the first question, rather than the child. Why did you begin the book this way? Harris: I think it’s important to ask children questions, guiding them in their investigations of the world, and to be interested in their unique thoughts about how things work. 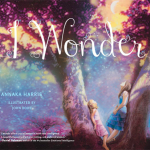 The book sends a message to parents that children don’t have to be the only ones asking questions—we can ask our children questions about the universe too! I also wanted to get to the child’s experience of not knowing as early as possible, so I began the book by directly asking a question to which her response would naturally be “I don’t know.” In fact, the original title for the book was I Don’t Know. And finally, I thought it was important for children hearing the story to be reassured by the mother right away, when she says, “It’s okay to say, I don’t know,” laying the foundation for all of the subsequent conversations in the story. 6) learn to say “I don’t know” by seeing it modeled in adults, which I believe is the most powerful way to teach children. Q: When the mother tells Eva that no one knows where gravity comes from, it seems like people could misread this, coming away thinking you’re saying we don’t know anything at all about gravity. Are you worried about this miscommunication? Harris: The main goal of the book was to model a new style of dialogue between adult and child. I wanted the book to be appropriate for the youngest children possible—starting at 12 to 18 months—while still addressing complex ideas. The part about gravity was difficult to write, because the challenge was to get to a fundamental force or interaction that I could say is still mysterious in some sense—without being too wordy, or too complicated for young children, and still relating to Eva's walk. Given all the variables, I decided this was the best way to begin the conversation about mystery, and I'm not too worried that the reader will think I'm saying we know nothing about gravity. The point was for Eva to ask a question that not only her mother doesn’t have the answer to, but nobody has the answer to. Something that inspires wonder, and something that unites all of humankind. A mystery for everyone to share. Q: You say that you wrote I Wonder for adults as well as children. Can you explain more about why? Harris: I think that we need to remind ourselves that it's okay to say “I don't know,” as much as we need to pass this message on to our children. We often have the most clarity and insight when talking to our children, and we're often reminding ourselves of the very lessons we’re imparting to them in that moment. A good example of this is when we have a hard time separating—when we’re dropping our kids off at school for the first time, for example, and we say “I know you’re sad, but you’re going to be okay. Your teachers are here to take care of you, and Mommy will be back soon!” We often need this reassurance as much as they do. So I wrote this book with that in mind. This book is something I wanted to create for parents to share with their children, which is different from writing a book primarily for children to enjoy. I wrote the story that I wasn't able to find on the bookstore shelves when I went looking for the book I wanted to read with my daughter. My assumption was that there were other parents out there who wanted a book like I Wonder. It was important to me to get the parent-child balance right, and it was a challenging task. I consulted with many developmental experts, children’s book editors, scientists, parents, and children. I also selected the artist very carefully. I wanted to find the balance between a story that really speaks to parents and one that is engaging for children, and I think John Rowe did a spectacular job of helping to accomplish this. Harris: I wanted there to be room for an extended conversation between the adult and the child while reading the book. Each answer—clouds, frogs, and me—addresses the subject of impermanence and cycles in a different way. Clouds change right before our eyes and are always there to remind us of the ever-changing nature of things. Frogs go through distinct life cycles, which opens the door to a conversation about life and death. And the child’s placing herself in the world is also important. Her simple answer in the book, “ME!,” leaves room for interpretation. She could be talking about her awareness of her own growth from a baby to a little girl, or her changes in mood, clothing, hair, etc. Each answer gives options for different directions in which to take the conversation. There are many answers and many ways to explain impermanence. I encourage parents to build on all these concepts and conversations. The text in the book is intended as an inspiration and a starting point.